Our Old-Fashioned Filled Hard Candy - Washburn Candy is OUT OF STOCK, but we have ordered more! You are still able to purchase it now and we will ship it to you as soon as it arrives. Questions? Please call 1-800-438-5346 or email us at info@Lehmans.com. These are the shiny, colorful candies you remember from the candy dish at Grandma's. Or, maybe they were your favorite after-school treat from the corner store. Now you can enjoy them again (and again). Display them in your favorite dish but beware, they won't last long! Ingredients: Sugar, corn syrup, partially hydrogenated coconut oil, cocoa, red raspberries including potassium sorbate, sodium propionate, sodium benzoate (preservatives), citric acid, salt, natural and artificial flavors, U.S. Certified Food Colors including Yellow #5, Yellow #6, Blue #1, Red #3 and Red #40. Manufactured in a facility that processes peanuts. When I opened the candies they were in clumps, stuck together and some in pieces. i've been buying these for the past 3 or 4 years. I keep one in my desk drawer at work and one at home. They satisfy my sweet tooth. And I'm like a little kid when I get to the soft center filling. Thanks for a lovely product at a reasonable price. 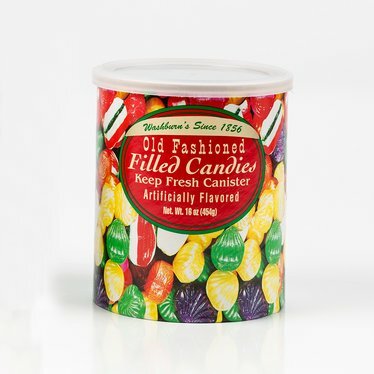 I love this candy so much that during the holidays I buy at least 12 cans, but this year I ran out several months to early and couldn't get any until maybe October or November, so I look on the empty container, found the manufacturers name and looked online and the first order was 4 containers I think in June 2017 and the second order was 2 containers in August 2017, this is now September and I'm getting ready to order another few boxes until the holidays. Finally found these for my 87 year old dad. He is now sitting in his chair, watching baseball, and happy as can be with his candy close. Thank You! The filled heard candy arrived quickly and taste just like I remember from years ago. They are fresh and so delicious. Thanks for the great product choices. My elderly friend and I have been picking these up for years. They started becoming impossible to find. I was so pleased to find them at Lehman's! They are reasonably priced and arrived quickly! I was looking for old fashioned candy and found these at lehman's. They remind me of the candy my mom and grandmother had in the house when I was growing up. They are pretty, flavorful and my husband loves the filled centers. He took a few to work with him and gave a couple to co-workers who liked the candy so much they asked where they can buy it. A great product!